Jungle Disk Simply Backup is a popular cloud backup service that has a few advantages over some of its peers. Private key security, an easy to follow interface and support for multiple operating systems provide a well rounded approach to this crowded backup landscape. There is one plan, which costs $2.00 per month plus storage fees. You can choose to have either Rackspace (Jungle Disk's parent company) or Amazon S3 host your data. Both hosts offer the first 5GB free. The other charges are summarized in the table below. When installing the program for the first time, you are prompted to enter your credit card or PayPal information. This is done so that the initial $2.00 charge can be collected before the software is installed. But I found the lack of a free trial somewhat disappointing. How do you know you will like the software if you are not allowed to test it first? On a more positive note, there are no file size limits or storage limitations on your cloud backups. Any file type can be backed up and retrieved without the hindrance of upload or download restrictions. 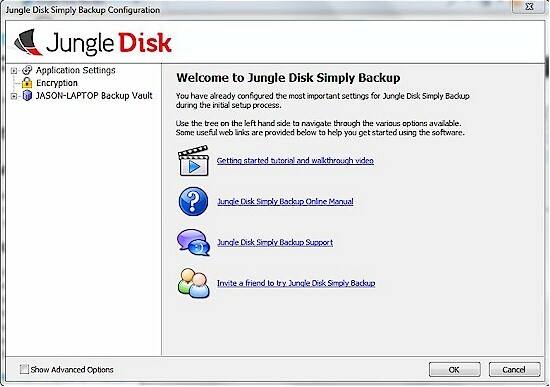 Jungle Disk Simply Backup is available for Windows (XP or higher) and Mac operating systems. There is no support for Android, Blackberry, Palm or iPad/iPhone devices. Installation is straightforward. Once the initial fee is paid you create your login account, then log in and start the software download. Jungle Backup prompts for the correct version of your software offering a 32 bit and 64 bit installation option for Windows. This process took less than one minute and opened automatically into the configuration setup. You then choose the files you would like to back up and the time for the backup transfer to take place. Options for predefined folders are displayed automatically with the ability to choose to other folders if necessary. This setup was intuitive and very easy to follow. Jungle Disk Simply Backup Utility Monitor is the control center for this program. The base interface houses options for starting or disabling backup jobs, beginning a restore process or altering the programs configuration options. Within this configuration tab, all of the more advanced settings can be accessed. These include account settings, bandwidth control, scheduling, security, and selection list options. This is the pricing if Amazon hosts your backup data. This is the pricing if Rackspace hosts your backup data. When installing in Windows you can choose 32bit or 64bit. It is easy to choose default folders or custom backup selections. All confurations are done from this screen. All advanced options are located under the configure tab. Power users may find the lack of specific network configurations a hindrance. Under the network configuration button, only the ability to add proxy settings is available. Port selections and other network settings are absent within this interface. As this is the base offering, these options are designated for the other "higher end" backup options from Jungle Disk. You do have the ability to limit bandwidth use, however. A more interesting and useful feature is the ability to create vaults. A vault is a specified backup set that enables automatic compression as well as features that prevent the backup of duplicate items. All features in the software interface are clearly defined and simple to understand. Novice users should have no problems using this backup solution. When attempting to start a file restore, the software displays a simplistic folder view of backed up files. Restoration is as easy as clicking on the desired file within your virtual disk and choosing the restore option. Restoration can be done from the virtual disk or a specified backup vault. All backup data can also be retrieved from the newest backup set or backdated to restore a file that was backed up several days prior. This can be helpful for restoring files that have had traces of corruption. Once the backup set has been chosen, a window appears that prompts for the restoration path. You have the option of restoring your files to the original location or to a different folder through this screen. Jungle Disk also is smart enough to know what is installed and can only restore files that are missing. This allows you to easily restore your files to their original configuration without having to know what exactly is missing. This option can be particularly valuable for restoring files that may have become damaged or inaccessible. You also have internet access to your data via the web login feature. By going to www.myjungledisk.com you can perform most of the same functions supported in the console manager. I found this interface somewhat slow and unresponsive. The web interface took awhile to load and I was not able to use the interface for roughly 30 seconds. This was not due to a slower network connection because my internet was working with no issues. This could be a problem for people who need to use this feature. Once backup sets are completed, block level backups can be performed. This can alleviate some of the initial upload time as continual backup sets will be incremental. As with anything online, outages can hinder the ability to retrieve data. This may be a concern for those who have time sensitive needs. By visiting the online support documentation it is easy to see that Simply Backup is the most streamlined and simplistic software option Jungle Disk offers. Support is limited to an online ticketing system and FAQ. Those seeking quicker support options may want to look elsewhere. Support options are mediocre and could be improved with better documentation. Some of the most noteworthy features of Jungle Disk Simply Backup are the security options. You are given the option of having two-way security with a private key that you can generate. Since you select your own key, backup data becomes more private and secure. This is a step above other backup programs that do not allow you to choose your own key. Simply Backup utilizes AES-256 bit encryption that offers enterprise level protection. When compared to other base level backup options, Simply Backup shines in this area. Overall, Jungle Disk Simply Backup is a simple and solid backup solution aimed at home and small-biz users that caters to those who need not be bothered by advanced network settings or power features. There are other software suites offered by Jungle Disk that are more fully-featured. But, if you don't need bells and whistles, Simply Backup does an adequate job at a cost effective price with better security features than some of its peers.